Our expert’s sample activities show how using free tech tools can help students learn to analyze, evaluate and create. How can the use of apps on an iOS or Android tablet help teachers develop these critical thinking skills in students? Concentrating on apps that can target the cognitive thinking skills at the high end of Bloom’s Revised Taxonomy (2000) is one way to work on this process. Since many schools now have BYOD programs, finding apps that are available for both the iOS and Android operating systems makes it easier for teachers to develop formative and summative assessments that all students can complete. If educators are familiar with what the creative tool is capable of, they are more likely to develop engaging and meaningful assessments as well as provide technical support for their students. Educators should first re-familiarize themselves with the concepts inherent in the higher-order thinking skills of Bloom’s Revised Taxonomy. Analyzing includes breaking information into parts to explore understandings and relationships. Apps that fit into the "analyzing" stage improve the user's ability to differentiate between the relevant and irrelevant, determine relationships, and recognize the organization of content. When analyzing, students complete tasks that involve structuring, surveying, outlining and organizing. The evaluating level has students making decisions about the value of content based on criteria set by themselves or external sources. Apps at this stage help students judge content reliability and accuracy, quality and effectiveness. They also help students reach informed decisions. In evaluating, students show their understanding of a topic or participate in evaluating a peer’s understanding of a topic. The creating level helps students reorganize acquired knowledge and information to create a new end result. Apps at this level provide opportunities for students to generate ideas, design plans and come up with a new way of doing things. Creative projects can involve video editing, storytelling, videocasting, podcasting or animating. Showcasing apps out of the context of the instructional process is not very helpful. Pedagogy should always come first, and the tool second. The following activity begins with students watching a video that tells a story. I’ll then offer two sample assessments of each of the three highest levels of Bloom’s Revised Taxonomy, as well as an app for each assessment. Analyzing assessment 1: Outline the relationship between implicit and explicit themes in the video. Concept maps allow students to brainstorm their thoughts on a topic and then arrange them into connected categories and groups. Mindomo helps them import images from the camera roll/gallery and labels and place them on connecting lines. For this assignment, students could easily grab screenshots from the video and import them into their Mindomo map to provide the supporting textual information about the implicit and explicit themes in the video. Mindomo also has many icons that can be placed in the map to provide further clarification. In addition to iOS and Android, Mindomo is available for Mac, Windows and Linux operating systems. Here’s a sample Mindomo mind map. I also have a page with much more information dealing with the ways concept and mind maps can be used to support the instructional process. Analyzing assessment 2: Differentiate the ratio of pathos/logos/ethos in the video. Podcasting can be used for students to analyze a topic. Students first write their script and then record the podcast. audioBoom is an app for tablets that allows students to create up to five-minute-long podcasts. Students can record, pause and play back their “boos” before publishing them to the audioBoom website. They can also add an image to illustrate their podcast. Students will need an audioBoom account to publish the podcasts, since they are hosted on the audioBoom site. An RSS feed is attached to each podcast, making it easy for a teacher to aggregate and assess the podcasts. audioBoom has a page with other educational ideas and samples here, and also offers an Edmodo plug-in. Ed tech consultant Tony Vincent provides other ideas for using podcasting in the classroom on his site, too. Here is a sample of a podcast rubric, and here’s a sample audioBoom podcast. Evaluating assessment 1: Evaluate the credibility of the video and suggest two ways it could be improved. A screencast or screen recording is created on a tablet by starting with a blank page. A student then imports an image to use as a background and marks it up while recording a voiceover. Videocasts allow users to add additional pages and create a movie that can be shared. Lensoo Create is a screen-recording app that helps students create a single page at a time. The recording pauses between pages, giving the student time to prepare for the next page. The platform interface includes a text tool, image import and a library of icons to add to the recordings. Lensoo Create also allows users to import PDF files. Students create an account on the Lensoo site and publish their completed screen recordings to their account online. The recordings can be public or private, and students can share the URL with others. The free account allows for unlimited recordings up to 15 minutes in length. You can find additional ideas, tips and rubrics for using screencasting in class on my page here, and here’s a sample Lensoo Create screencast. Evaluating assessment 2: Reflect on the theme of the video and relate it to a personal experience. Writing blog posts can help students learn reflection, especially when they get comments from the teacher and/or their peers. Tumblr allows students to type, insert images and videos, and share links as they find or create material to share in their reflection. Users can create Tumblr posts and comments when they’re offline and then upload them when they’re connected to the Internet again. Tumblr also provides a special e-mail address for students to use if they want to post text via e-mail. Students can save drafts of their posts to work on later and even queue their posts to be published on a certain day. It is often helpful to provide students with a rubric for a self-reflection post (or to create one with the class). Here’s a sample rubric, and here’s a sample student video reflection. Creating assessment 1: Re-create the video from another perspective. Tellagami (pictured above) allows students to create a virtual avatar and then import a background image or draw their own background picture to use in a 30-second video. 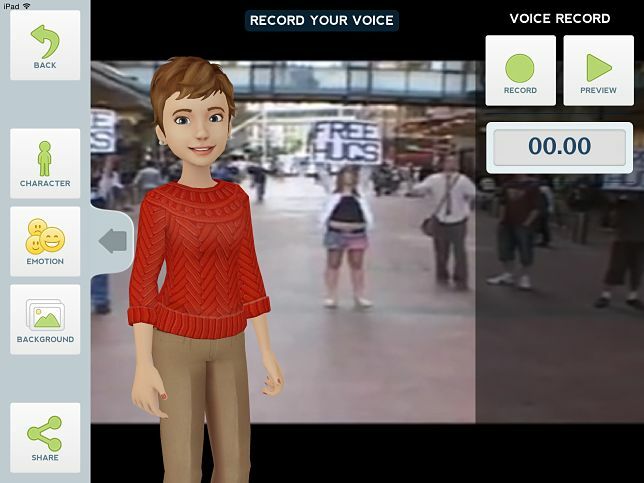 Users can record their own voice or type the dialogue text and pick a voice for their avatar to use when talking. This comes in handy when a student needs to use a voice of the opposite gender for a character. Users send their completed “gamis” to the Tellagami server, and the link can be posted to Twitter or e-mailed. The “gami” can also be directly saved to the mobile device’s camera roll or gallery, or uploaded to video-hosting sites or a file server. To create a longer digital story students can make a series of 30-second “gamis” with various avatars contributing to the story. They can then import these movies into a video-editing app on their mobile device and create a digital story from another perspective. Here’s a sample Tellagami digital story. Creating assessment 2: Revise the video for a new audience. An important communication skill for students to practice is to watch a video and then create a presentation or video for a different audience than the intended audience of the original video. This can take the form of slides with words, a mixture of types or subjects of images, and everything in between. To create their content slides, students can use Keynote, Haiku Deck or Google Presentations on the mobile device and take screenshots of their completed slides. They can then insert these screenshots into the Magisto project. There is a random nature in some of the Magisto themes, so students should experiment with a few different themes to decide on the impact they want to make. Here’s a sample Magisto movie. Developing the higher-order cognitive skill-set takes practice. By providing relevant assessments that take advantage of the powerful technology students now have at their fingertips, educators can help their students become the critical thinkers we want them to be.